You have a property that needs some love. It’s old, a bit ramshackle and couldn’t be rented out in its current condition. This could be a prime opportunity to renovate or detonate. With the place at its rawest and no tenants to consider, it might be time to take on project to breathe new life into it, or to scrap the whole thing and rebuild. But… should you? It’s a question that every investor in this position will ask. And it’s a tricky one to answer. There’s a lot to consider. And not having every single piece of information for an informed decision can cost you dearly. Deciding whether to knock down and start from scratch or to renovate the existing property is about more than the aesthetic condition of the dwelling. Bad wallpaper, ugly carpet, a seriously dated kitchen and bathroom or crumbling windows and doors are unsightly and they’re not always cheap to replace. But they’re often elements you can change without too much heartache. The bones of the structure are a more critical consideration. If you’ve got an old or poorly maintained property that has major structural flaws that will cost a substantial amount of money to repair, it might be more cost effective to detonate and rebuild. This is why it’s important to understand what you’re dealing with and when to draw on available help to determine your path. Firstly, use your own eyes. Look for sloping floors, significant cracks, a noticeable wall lean, rotted wood and shonky foundations. If your own inspection revels potential problems, then it’s time to call a professional. Enlist an engineering expert to determine what’s needed and the get quotes (more than one please) on the cost of rectification. If you’ve held the property for a long time, it’s worth getting a building inspection in any case. Things can change – sometimes quickly. Likewise, a pest inspection will determine if unwanted critters have moved in too. Again, white ant problems can be rectified, but costs vary. Get those multiple quotes so you can make an informed decision. Take a look around your area. What do buyers and tenants desire in a property? If the suburb appeals to cashed up young professionals, that pokey little rabbit-warren of a cottage could be brought into the 21st Century with a renovation and some careful floorplan rejigging. If it’s an area with lots of families who want space and room to grow, then you might need to think bigger. You might have to consider a substantial renovation project that involves an extension. In some cases, the most cost-effective solution might be knocking it down and rebuilding with a dwelling that meets market expectations. It could be that the market wants an architectural home, or the demographics demand efficient and minimalist but carefully considered living, such as townhouses. Really get to know your area. Figure out what works and what doesn’t. Look at its evolution. Examine demographics and population changes. Consider if there are shifts on the horizon too that could begin to impact you when the project is complete. Is gentrification happening? Is the resident base ageing? Are there infrastructure projects or developments that will spin things around? And especially don’t just look at the now if you plan to renovate or rebuild and hold the investment. Consider future market shifts and plan accordingly. Once you’ve gathered the info, it’s time to open up Excel and start running the numbers on a variety of scenarios. The process at this stage is to see if renovation money can be “well spent”. Plot out what the property is worth right now, as is, in your local market. Be realistic and do your homework to come up with a number that’s reflective. Let’s say its current value is $600,000. Now, look for similar dwellings that have been renovated to a really good level and see what sale price they’re achieving in the market. What would your place be worth if you were to completely overhaul it? Let’s assume its post-renovation value is $850,000. Now, do calculations on what a renovation will cost. You might figure out what a full-scale revamp will set you back at least $100,000. In this scenario, the profit margin is pretty attractive. In others, it might not be. Is a renovation going to deliver a profit that’s decent enough to be worth your blood, sweat and tears? And money, time and sanity? 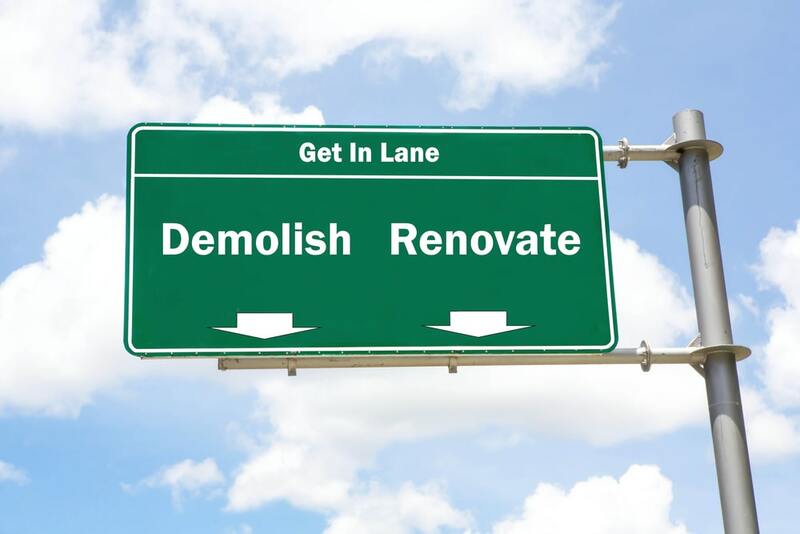 In some cases, you might get more bang for your buck by knocking down and developing the vacant site. A blank canvas is an exciting prospect. You could look at a duplex. You could look at a number of villas. You could consider a small-scale unit development. There are lots of possibilities and you should think them all through very carefully if you choose this option. But once again, enlist a team of experts so you know what’s involved, how much it’s going to cost and whether it’s a worthwhile investment. And you should be sure you’re able to afford it. With any estimate on costs, even those provided by experts, add a premium to allow for unexpected expenses too. Allowing for contingency costs is what smart strategists do. Let’s say you’ve done all the sums. The place in its current condition won’t do. A renovation is an option but you’re not sure there will be a worthwhile margin for the grief. And a knock-down and rebuild is attractive, but you can’t afford it or don’t have the time and expertise. There’s one other course of option to consider… moving on. Sure, the place needs a lot of love, but just because you can’t manage it doesn’t mean others won’t see the potential. There will be some who even relish the challenge of a project. Properties with potential can yield extraordinarily great results for the well informed or become a money pit of pain for those who don’t get smart. The complexities of deciding which strategy is best are tough for most investors to grasp, so why not reduce the stress and mitigate the risks by leaning on a professional. Experienced buyers' agents know how to analyse the info and bring about the best result so you can make the right choice on whether to blow up or build your holding.